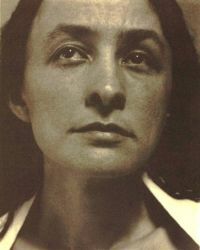 Georgia O’Keeffe. Photo by Alfred Stieglitz. That is what I woke up to: that thought, “I feel scared.” It came like a clear flash. In that moment, it was true—that was what I felt. There was no point in any denial. It was a moment of seeing that there was this field, or ground, or cloud of fear that has accompanied me in this life, and in certain moments, starkly reveals itself. Around age 50, when you go to the doctor, health care providers start to recommend various screenings and tests. I am not writing about the value or validity of these screenings, but about what has been unearthed and revealed in my own heart/mind in response to this stage of life. But then I do not seem to apply the same logic to my own well-being. Denial is clearly the stronger sentiment. So I woke up mulling over why I didn’t want to do this test or that test. And then, after mentally wrestling with my own mind, came the crystal clear and embarrassingly simple resonance of something very true. It was a clear bell ringing, “I feel scared.” But the interesting thing about fear is that it is not relegated only to those things that I don’t want to do. “I have been absolutely terrified every moment of my life—and I have never let that stop me from doing a single thing that I have wanted to do.” This was written by one of my creative and feminine muses—Georgia O’Keeffe. I love this because it acknowledges this cloud or ground of fear that can ride us or that we can ride upon, and yet we do not have to succumb to it. Nor do we have to throw it off, fight or wrestle it. O’Keeffe says she was absolutely terrified every moment of her life—and yet, look at her paintings. I do not see terror or fear as an overwhelming voice in them. I see a world that is full of fluidity and vibrant color that fairly leaps from the canvas. It feels as if these perceptions or these visions came from an honest place, from clear eyes. From honest eyes. It is a delight to see the world through her eyes. To see the depth and immensity of the New Mexico night sky with its plethora of stars from beneath a tree as in the painting “The Lawrence Tree.” We see the night sky though the bare tree branches which reach upward like roots into a vast dark space speckled with stars. The night sky becomes the earth, the ground. She writes, “I never let it (the fear) stop me from doing a single thing that I wanted to do.” It takes courage to fully share one’s view of the elephant, or to share the intimacy of the inner sky. Take for example the O’Keeffe painting entitled “New York, Night 1928-29.” This is a painting that looks down upon Lexington Avenue at nighttime. We see a view of the city from a sky perch, suspended in mid-air we peer out and into a darkness that is now dotted with the stars of manmade lights. We look out from a dense wine-colored blackness to see the hopeful warmth of the little gold and orange lights speaking to us from the building windows. The car lights far below on the avenue run like a river of sparkling water reflecting a life that continues to flow beneath us and around us—and even without us. Then an illuminated rooftop beckons the eye “come up here, rest up here.” In this darkness, there is life, there is warmth. There is the comfort of other people who really are just like us—little lights in the darkness, illuminated for a time. This one on, this one off, but always some light, someone, somewhere. When I look at this painting, it as if I am there, in the sky of the painting. I am in its stillness, yet feeling the city move from a distance. I can hear both the silence of the night sky, and the soothing sound of the street traffic. I am both warm and cool. It feels true. I remember this view of the city from the street level, from the inside of a taxi in December 1985. I looked out at the city lights while sitting beside the man who is now my husband. We had just begun dating. We were happy and in love. It was a very cold evening yet I was so warm inside. And the city moved all around us, and we were moving in it, and yet all was still, all was well. “Sometimes it is the fear that brings you the presence.” This is what Rumi says. Love is like this. It is scary. It brings presence. We may indeed be terrified—of loss, of the unknown, but we fall into it anyway. We learn to flow with it, like the traffic. When I do a difficult yoga asana, or one that scares me for instance, I feel much more present. I know that I have to pay attention. To my body, to my breath, and yes, even to the fear. Then I act with all of myself. I may feel fear but in the doing, the acting, the being, the loving, the fear falls away, it is transformed. It too changes, like everything else. There are many ways to bring steadiness to the heart and the mind, to the body, to the breath. And steadiness does not negate movement. There are many ways to cultivate awareness. And there are many ways to work with fear. I write here about the acknowledgement of it, and of acting anyway. Whatever that action might be. The fear may be there, as a sensation somewhere in the body—but so what. There is work to do, people to love, paintings to paint, poems to write, a life to be lived. Today’s guest contributor, Carrie Owerko, is a senior certified Iyengar yoga teacher based in New York City. Prior to her study of Iyengar yoga, she spent years exploring the human body through theater, dance, and experimental movement. Her website is http://www.carrieowerko.com.